Are you still deciding on what snack to bring to your 4th of July party this weekend!? 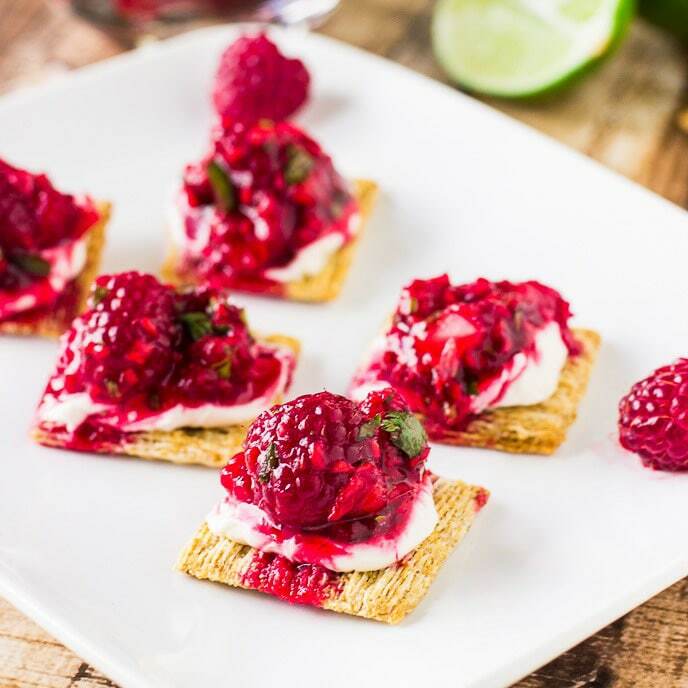 No worries, I got you covered with these easy Raspberry Salsa Bites, that are guaranteed to be a hit at the party! These delicious bites are fruity, tangy, and sweet with an added crunch from the Triscuit cracker. And they’re pretty, too! This raspberry salsa is so easy to make, all you need is fresh raspberries, onions, cilantro, jalapeño peppers and fresh lime juice. Mix all the ingredients together and you have a fresh,summer raspberry salsa. Spread each Triscuit cracker with honey pecan cream cheese but you can use regular cream cheese, as well. 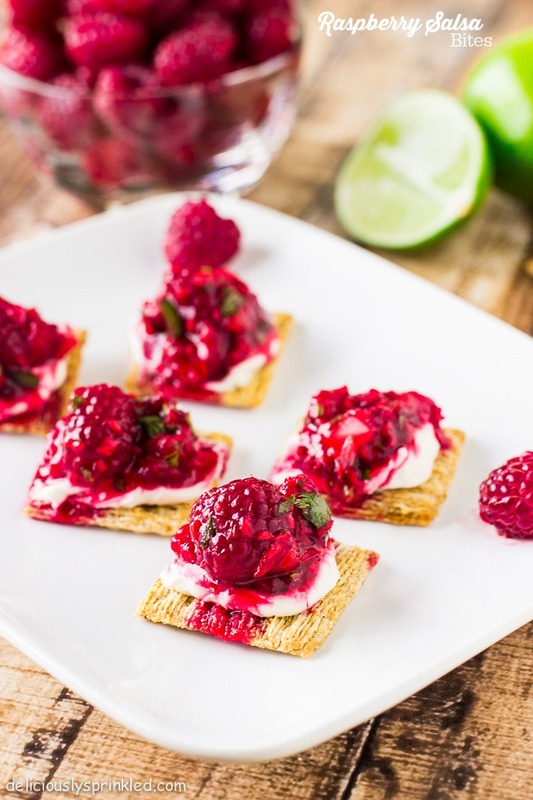 I just prefer the honey pecan cream cheese because it’s the perfect pairing with the raspberry salsa by adding a little bit of sweetness to each bite, making it one of my all time favorite snacks to bring to a party! Place washed raspberries in a small bowl, set aside. Chop sweet onion, jalapeño pepper, and cilantro. In a medium size bowl, combine raspberries, onions, jalapeño peppers, and cilantro. Stir together and slightly mash raspberries. Squeeze fresh lime juice on top of salsa and stir until combined. 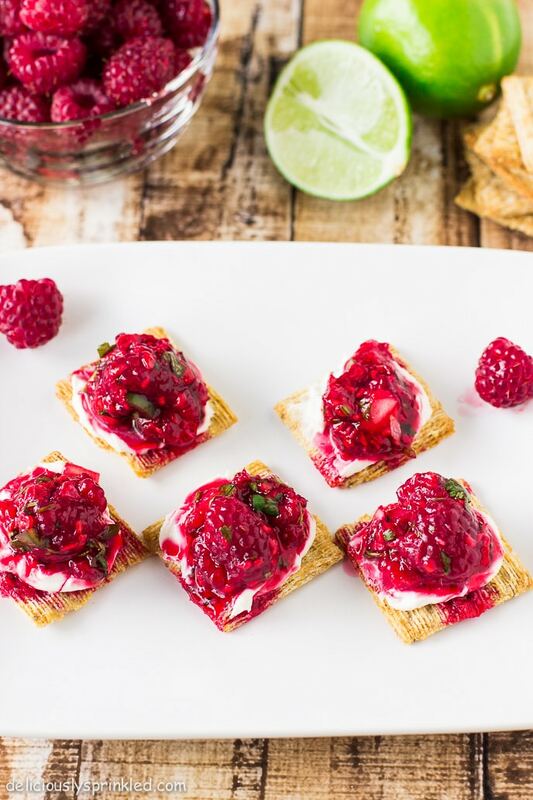 Spread each Triscuit cracker with honey pecan cream cheese spread and top each cracker with about 1 teaspoon of raspberry salsa. Serve chilled & enjoy! These look incredible! I’ve made a raspberry dressing before, but this salsa jammy is over the top! I LOVE IT! These gorgeous little bites of yours are calling my name! This looks incredible and not something I would have thought of! Raspberry salsa– yum! I would never think of it, but it looks absolutely delicious! Raspberry salsa bites? Oh my word. This looks like snack heaven. Yum! I love savory and sweet! Oh, what an interesting salsa! I’m putting this one on my weekend to-try list. I love raspberries on a savory appetizer. Sounds perfect for a summer party! These little bites look amazing! I would never have thought to make a salsa with raspberries, how clever! So easy and I LOVE the color! These look amazing and I can’t wait to try them! raspberry salsa sounds amazing. What a beautiful color. These photos really pop! What a great idea! Love a good fruity salsa – I think peach might be my favorite, but I’ve never tried raspberry! This recipe looks delicious!! I love raspberry and it would be pretty on the Fourth, too. Pinning now. Yum. This looks so good! I have never heard of raspberry salsa before but I can’t wait to try it! That raspberry salsa sounds amazing! Perfect little appetizers! Yum! Never topped crackers with raspberry but I bet it rocks! Have a fabulous Monday Jenn! I love fruit and cheese together. Even better topped on a crispy cracker like a triscuit. Beautiful and delicious! I love the flavors you’ve put together in this recipe – I’ve combined jalepenos with other fruits but never with raspberries! I can’t wait to try this! that looks seriously amazing! yum!! I’ve pinned it to try later with raspberries are in season here. Raspberries are a favorite of mine and this looks like the perfect combo!! Jenn, these are beautiful!!! And I’m loving the flavors that you used. Can’t wait to give this one a try! Jenn, all I can say is YUMM!! What a delicious snack idea!!! I love all salsa, and this raspberry version sounds incredible! These are adorable! Love the idea of raspberry salsa. This looks AMAZING!! What a tasty, unique idea!